The dynamic protagonist of city life, the Missoni free spirited woman turns to men’s sportswear for inspiration. Oversized items couldn’t be more comfortable. Soft, fleecy fabrics reign and knits play a key role in her wardrobe, hugging her body letting her move freely and accentuating her sensuality. Palladian marble camouflage, cut-out patterns, and inlays in calgan, Persian lamb and mink, as well as vivid flashes of color and exaggerated scales come together to form the leitmotifs of her wardrobe, which includes sleeveless cardigans, parkas and short padded knit jackets with hoods, as well as single-breasted coats with a sartorial air. Knits with fur bodices, sleeveless cardigans and tops can be coordinated with comfy cargo pants rolled above the ankle. Skirts go from very full to pencil-thin and there are also track pants with a drawstring waist. The body-hugging polo shirts and crewneck sweaters are ribbed, space-dyed or found in degradè. 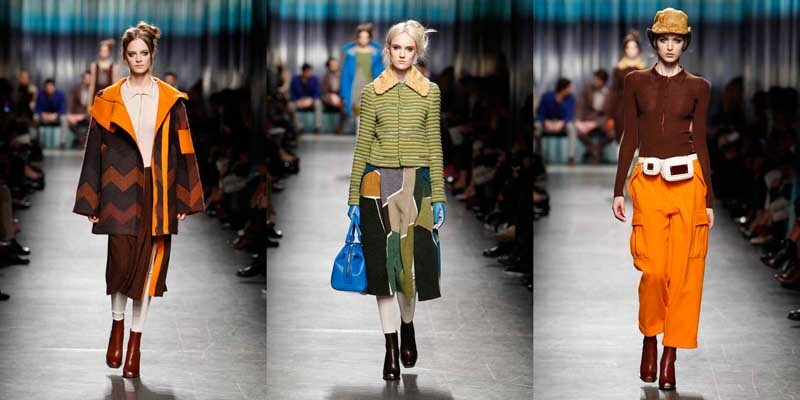 Solid colors – from yellow to orange and from grass green to turquoise – accentuate the unique detailing found in the collection, including the edges on sweaters, knee socks and thigh-highs, hems, flashes of color on pocket flaps and the elastics straps on booties featuring a square toe and zigzag heel. These vibrant colors are combined with ultra-classic and naturalistic hues including white, grey-blue, beige, brown and olive. Looks feature a combination of materials such as boiled wool, silk, organza and cashmere, textures in relief and imperceptible patterns; these elements come together to evoke a contemporary painterly inspiration. Irregular polychrome polygons appliqués in Perspex decorate little pouches worn on belts, nappa rucksacks and handbags and appear in lacquered metal as embroideries. The wardrobe is completed with crocheted wool caps tucked under felt hats with a narrow raised brim, all coordinated with Persian lamb collars and gloves. The collection weaves fashion with street style, informality and the utmost sophistication.